Where can I find and purchase SHRM eLearning products? SHRM eLearning products can be found and purchased in the SHRM Store, here. Please contact us if you intend on placing a corporate order for 25 licenses or more. What products can SHRM eLearning help with? For general assistance with the purchasing process, membership, conferences, seminars, webcasts, the Employee Handbook Builder, or other SHRM products or services. For assistance with SHRM Store products that are not part of SHRM eLearning. For assistance with the SHRM certification or recertification. For assistance with the Assurance of Learning exams and study materials. For assistance with offering recertification credits for SHRM-certified professionals. For questions regarding SHRM eLearning products, please contact us directly. For information or assistance with SHRM eLearning products. Please note that calls are not received if voicemails are not left or sent to the proper inbox. One line is available—email is recommended. I no longer wish to receive mailers/emailers regarding SHRM eLearning. How can I be removed from the list? If you are receiving SHRM emails and wish to unsubscribe, click on the unsubscribe link at the bottom of each email. If you are receiving items by post, please submit an online “Mailing List Removal Request” form. Please keep in mind that mailers are prepared in advance and you may receive mailers for up to three months after the request is submitted. Please note that important announcements can be missed if you opt out of eLearning email notifications. Can my company download the course for distribution? No, SHRM eLearning courses can only be accessed through the SHRM eLearning Portal. Can my company view the course for free? 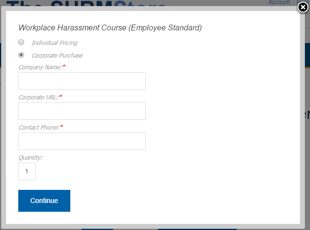 Please click here to view the Workplace Harassment course demo. Please click here to view the Ethics and Code of Conduct course demo. Please click here to view the Fundamentals of Employment Visas course demo. If you have any additional questions regarding our courses, please email us at elearning@shrm.org. Microsoft Edge, Firefox, Chrome and Safari follow a continuous release policy that makes difficult to fix a minimum version. For this reason, following the market recommendation we will support the last 2 major version of each of these browsers. Please note that as of January 2018, we do not support Safari on Windows. Windows XP is no longer supported by its original vendor, Microsoft, but if your organization has internal policies that have extended the use of Windows XP, SHRM recommends that your PCs be migrated to MS Windows 8 or above at your earliest convenience. If you are unable to upgrade your PCs at this time, we recommend installing the latest version of Google Chrome, as a temporary solution. How do I purchase a product for myself or on behalf of another individual? 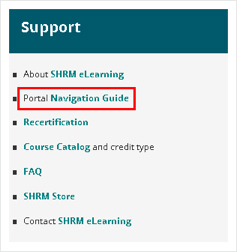 Start by logging into the eLearning section in the SHRM Store, here. If you are purchasing a course on behalf of another user, please have the user log into their account for you as the product will be assigned to the purchaser. Once you’ve found the desired course, click Add to Cart. If the product is available for corporate purchase, a pop-up will request that you specify if the purchase is for Individual Pricing or Corporate Purchase. Select Individual Pricing. Repeat until all desired courses have been added to the cart. Proceed to Checkout. The course(s) will be assigned to the purchaser account. Can I purchase and/or assign eLearning products to others in my company? Yes. The standard purchasing option (the "individual" purchasing option) will automatically assign the user license to the purchaser, just like with other SHRM products. If you would like to purchase blank user licenses that can be assigned to staff and track progress for those users, please use the corporate purchase option from your company's corporate adminsitrator account. What is a corporate purchase? Products available for corporate purchase are marked with a informational link. A corporate purchase allows one individual, the "corporate administrator," to purchase user licenses for staff in their organization and to track staff progress on the SHRM eLearning platform. One corporate administrator is allowed per organization, and corporate administrators are required to use an email address from the organization they'll be purchasing for. Third-parties and contractors that do not have an email address with the organization are not permitted to hold corporate administrator accounts. Please also note that, although single licenses can be purchased, corporate purchases do not create shared user licenses—one user license must be purchased per user, per use. What is the cost for a corporate purchase? SHRM eLearning only hosts individual user licenses, so one user license needs to be purchased per user. For corporate orders, please see the non-member list pricing to determine the cost for each user. Please contact us for orders of 10 licenses or more. The corporate administrator account is free—we do not charge companies for tracking capabilities. How do I place a corporate order? Start by logging into the eLearning section in the SHRMStore with your company email address. If your login username is not your business email address, please update it here before proceeding. If you are purchasing on behalf of the corporate administrator, please have the corporate administrator log into their account for you as the corporate purchase request will be submitted from the purchasing account. Please update the email address to the corporate email address if this has not been done so already. If the product is available for corporate purchase, a pop-up will request that you specify if the purchase is for Individual Pricing or Corporate Purchase. Select Corporate Purchase. Add the Quantity of licenses intended for use. In the quantity field, only add the number of users that will be taking the course—do not add an additional license for the corporate administrator unless the administrator will also be taking the course. The purchaser has given a corporate email address. The purchaser is the approved corporate administrator. A valid Corporate URL was given. The approval process can take up to one full business day. Once the purchase has been approved, the system will email one self-registration link per course to the corporate administrator. Can I get an additional receipt for my purchase? Click on any of the three options below. Click on My Orders & Donations on the left-side menu (cart icon). Corporate orders must be placed online via the SHRM Store. Please contact us if your organization requires an invoice. Unfortunately, gift certificates are not currently an option for purchasing SHRM eLearning courses. However, you may purchase courses on behalf of another person. Please log in as the user taking the course or the corporate administrator. Accounts and user licenses are assigned to the purchasers. Invoicing is available for corporate orders. If your organization requires an invoice, please contact us. There is no sales tax for eLearning products. How do I log into the SHRM eLearning Portal? To access your eLearning product, please go to the SHRM eLearning portal. Your username should be the email address that was used to register for access. The password was self-created. Please allow 1-2 business days for provisioning. Please note that shrm.org and the SHRM Store will not give access to the eLearning content. If you are a corporate user and do not remember registering your email to take the course, please reach out to your corporate administrator for your self-registration link. After you've registered for the course, you will be able to log in to access it. Please click use the "Need Help Signing In?" link on the eLearning website and the shrm.org login page. Return to the SHRM eLearning website once you have successfully reset your password. I've reached the maximum number of login attempts on the eLearning portal. What can I do? Once you've reached the maximum number of login attempts, you will be locked out for ten minutes. Please wait ten minutes before attempting to log in again. When does my access expire? All purchased licenses expire one year after the provisioning date. Course content can be accessed for as long as the user license is active, however please note that Certificates of Achievement will only be issued with the initial completion date. I made a corporate purchase. How can my staff access the course? Please forward this email to your staff. Staff members will register themselves for the course. Once registration is complete, please have users access the eLearning content via the SHRM eLearning website. Tip: Unintended registrations can be avoided by advising staff to not share self-registration links and reminding them to only register once. Multiple registrations will result in multiple licenses used. License assignments are permanent and cannot be transferred. Please see the Transfer and Refund policies for more information. My company purchased a course for me. How do I access it? If you did not receive this, please request the link from your corporate administrator. Please do not request the self-registration link from fellow staff members. This could result in misappropriation of user licenses and such errors are subject to the Transfer and Refund policies. If you experience difficulty with self-registration, please send us your email address, your member ID (if applicable), and your company name, and we will be happy to assist. 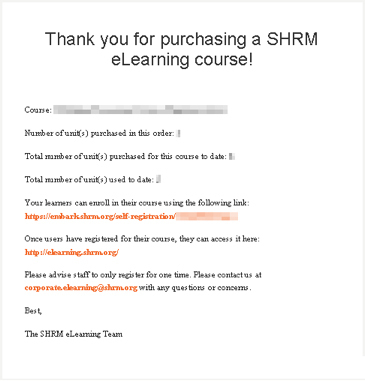 If you placed an order for a course from your account, please log into the eLearning website using the same email address and password that you use in the SHRM Store. If you have difficulty logging in, please send us your email address and member ID (if applicable). I'm on a mobile device. How can I access my eLearning content? Download the free Go.Learn app from your app store. Enter your SHRM username and password. Go to My Courses and Learning Plans and select the course you wish to view. Please note that administrative functions, such as downloading certificates and tracking progress, must be performed on a PC. How can I tell if an eLearning product counts for recertification credit before I buy it? Please review the SHRM eLearning Library Course Catalog to see which eLearning Library courses count for recertification credit. A la carte courses will have this detail at the bottom of the course/product description in the SHRM Store. Can I get certificates for eLearning courses? Yes, the vast majority of our eLearning courses have Certificates of Achievement which will all be stored in your transcript. Available activity IDs are located on the certificate. How do I submit the activity IDs for SHRM recertification credit? 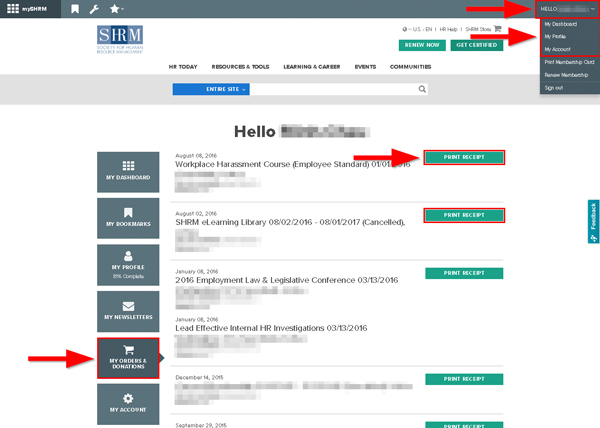 SHRM activity IDs are automatically loaded into the SHRM recertification portal on a bi-weekly basis, however if you would like to submit an item sooner, the activity ID can be submitted via the SHRM recertification portal. What are the limitations for submitting eLearning courses for recertification credit? SHRM-CP and SHRM-SCP holders can submit up to 60 recertification credits (self-paced). More information can be found here. How many corporate administrators can we have? One corporate administrator is allowed per company. This is the only user authorized to track staff progress and purchase more user licenses. How do we switch corporate administrators? Please notify us. If the new corporate administrator already has an eLearning account, we will be able to reassign corporate administrator capabilities. If the new corporate administrator does not have an eLearning account, please provide the new corporate administrator's first and last name as well as their email address and we'll be happy to create an account. Once the account is created, the new administrator will need to create a new password. Once this is done, login, tracking, and purchasing will be possible. If you are unsatisfied with the product, the wrong product was purchased, or if the license was issued to the wrong user, please submit a refund request directly to SHRM eLearning within two business days of your purchase time. If the course(s) have not been completed and the request was made within the refund window, you will be eligible for a full refund. Please send refund requests to eLearning@shrm.org and include the order number and the reason for your refund request. An unintended user was registered for the course. What is the transfer policy? Unfortunately we cannot transfer or "clear" user licenses as license assignments are permanent. If a course was assigned to an unintended user, a new license must be purchased in order to be replaced. Refunds can be requested for the original license, however the refund policy still applies. If you need your transcript from previous Conference OnDemand products, please send us your member ID and we will be happy to send your transcript to you! The close of the original eLearning website was announced early 2015. Users had until March 31st, 2016 to complete courses, spend tokens, and print Certificates of Achievement. December 31st, 2016 was the deadline to submit refund or transfer requests for remaining tokens and courses. Personal data (login credentials, transcripts, etc.) were not transferred to the new system. If Certificates of Achievement from the original system are needed, please contact us directly. I’ve already registered for an eLearning product. How do I navigate the website?